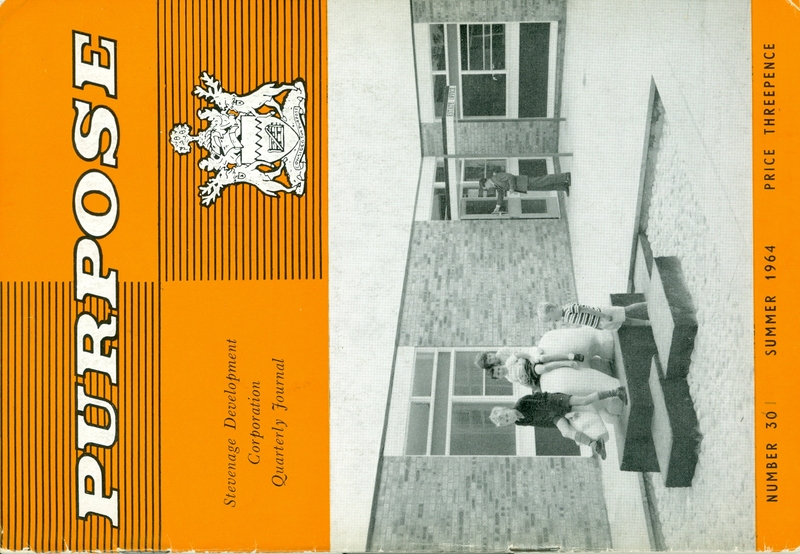 The Development Corporation Quarterly Journal, Purpose, charts the growth of the new town from 1955 to 1966 and was preceded by a bulletin, which began in 1951. 50 years on, the issue of Summer 1964 is a delight to read; its accessible tone and relatable stories show us today the innovative project that was the building of the New Town. This issue has a two page spread highlighting ‘what’s new’ and includes the new premises of Taylor Instruments, the annexe of Trust Houses Ltd, the improvement of facilities at the athletics arena at Ridlins Wood, the main hall at The Chells Community Centre, one of the new underpasses on Six Hills Way and the opening of the Bridge Restaurant over Queensway, the third Chinese Restaurant in Stevenage. All teamed with photographs, this illustrative and visual account is a fantastic overview of the innovative changes happening at this time. Although today these improvements to the Town Centre may seem common, such changes taking place were fascinating to local Stevenage residents, those intending to visit or were generally interested in the changing nature of Stevenage. However, it is the Front Cover image of this publication which really caught my eye! This delightful stone polar bear was a firm favourite among children passing by the new estate office at the Chells neighbourhood centre. 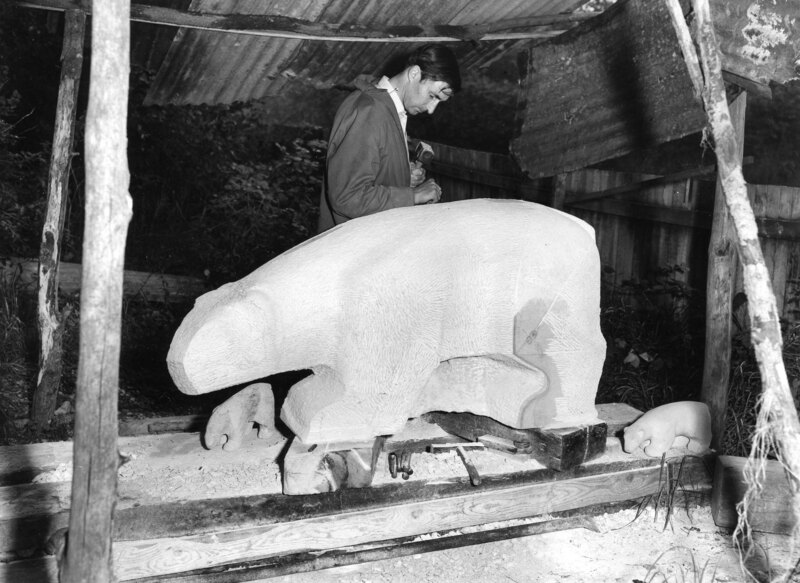 In our collection, not only do we have a photograph of the bear itself but also a photograph, taken by Mr G Blake, of Mark Harvey sculpting the bear in his workshop at Aston End. 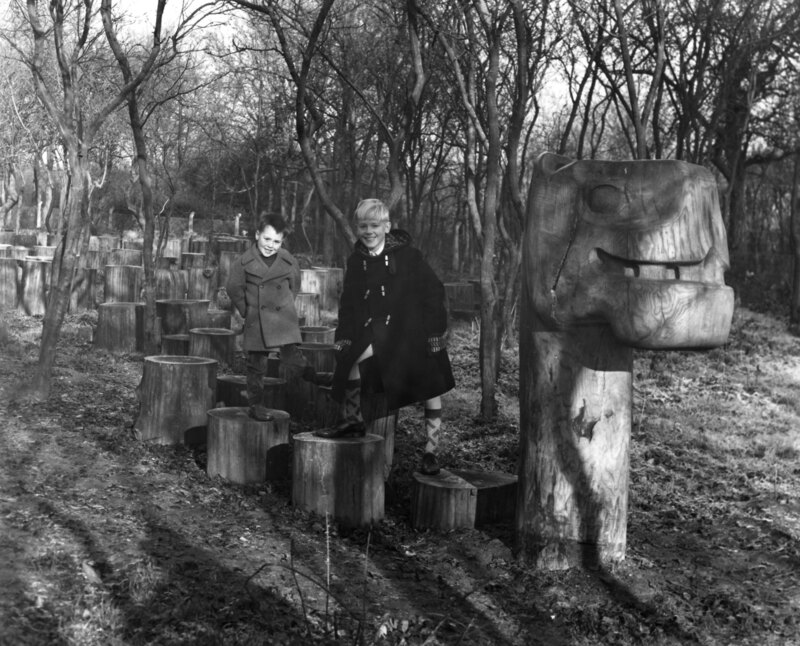 You may remember another of Mark Harvey’s sculptures just off Chertsey Rise, best known as ‘The Monster of Bandley Hill’ too. Other articles on town landscaping, planned road works and improvements, the near completion of the ‘Mormon Church’ on Monkswood Way and a biographical account of Deputy Chairman of Stevenage Development Corporation, P. B. Martineau, also feature in this issue. 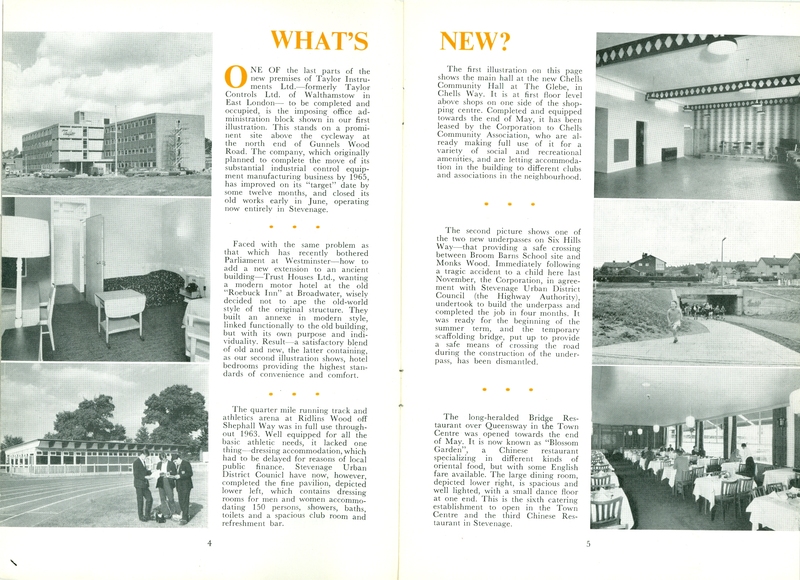 The scope and variety of its content shows not only the diverse audience in Stevenage at this time and still today, but also shows the expanding nature of the Town and the huge impact the New Town had on Stevenage residents. 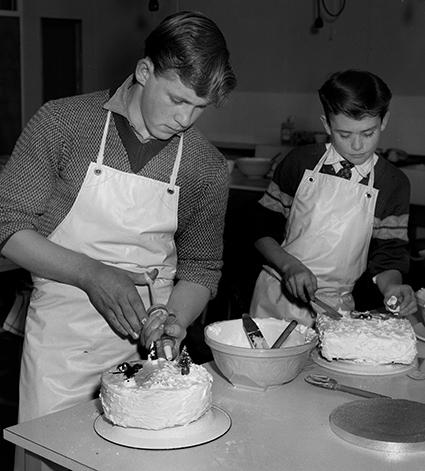 So, how better than the end the publication with a delightful story titled ‘The Young Modelmakers’ who were a class of young children at Peartree Spring Infant’s. 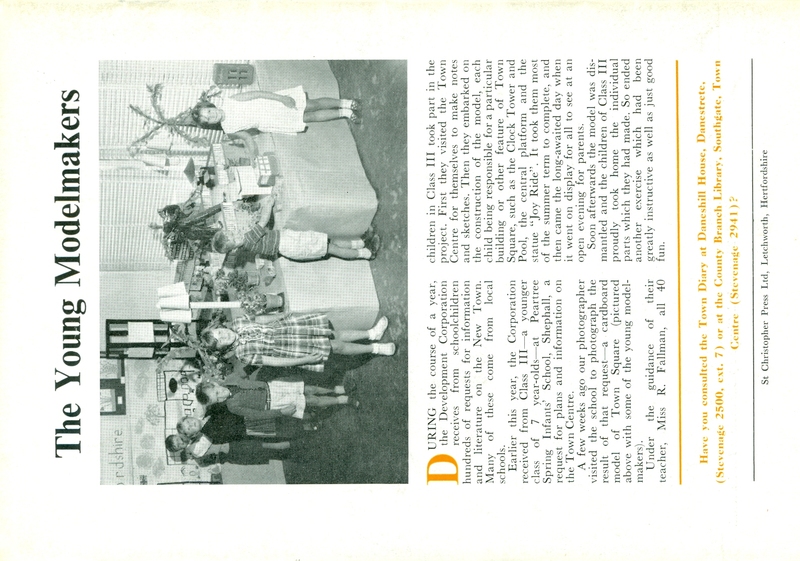 They made a model of the town square as a classroom art project during the summer of 1964. Forty children took part in the project which involved a visit and sketching of the site. the children were then each assigned a building or section of the model to complete. Taking them most of the term to complete, they displayed it with pride at an open evening. Sadly, the model was dismantled. However, the children took home the pieces they had made as a keepsake. In May Grete Dalum-Tilds and volunteer Jackie Noonan interviewed Derek Bradnick and Susan Church for the Talking New Towns oral history project managed by Stevenage Museum and funded by the Heritage Lottery Fund. 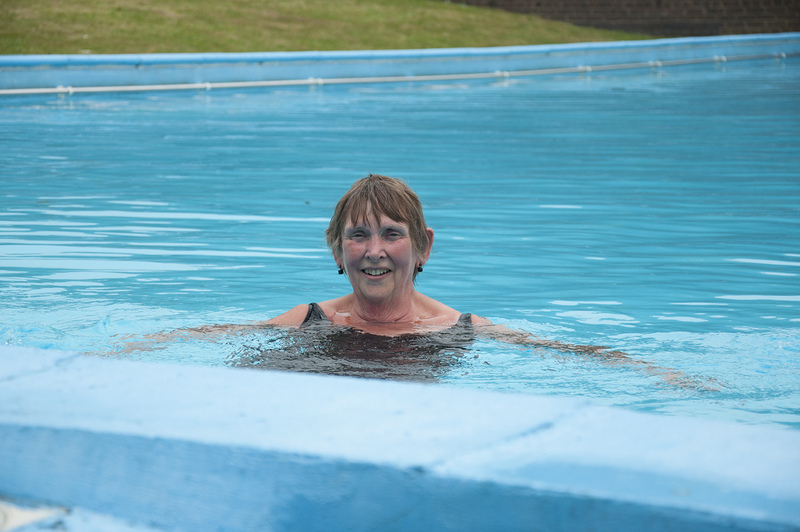 In the process of the interview we discussed schools and swimming lessons, Sue mentioned that her Dad used to contribute to the pool at Barnwell School, but that she never swam in the pool. “Cos there were no pools in Stevenage. Barclays School had a pool, but obviously they weren’t going to lend it to other schools, were they? 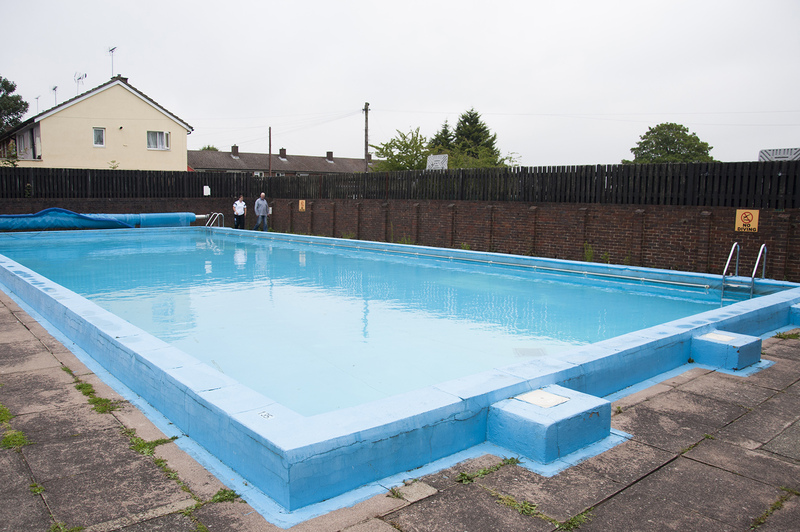 But Barclay school had a pool, that was the only pool in the town. My Dad paid sixpence a week towards the pool, that they were building at Barnwell and I never even put my big toe in it. She kindly invited me to come along and take a photo, and so I did. I think I can forward a thanks to Barnwell School for making this happen, and thanks for sharing the moment.